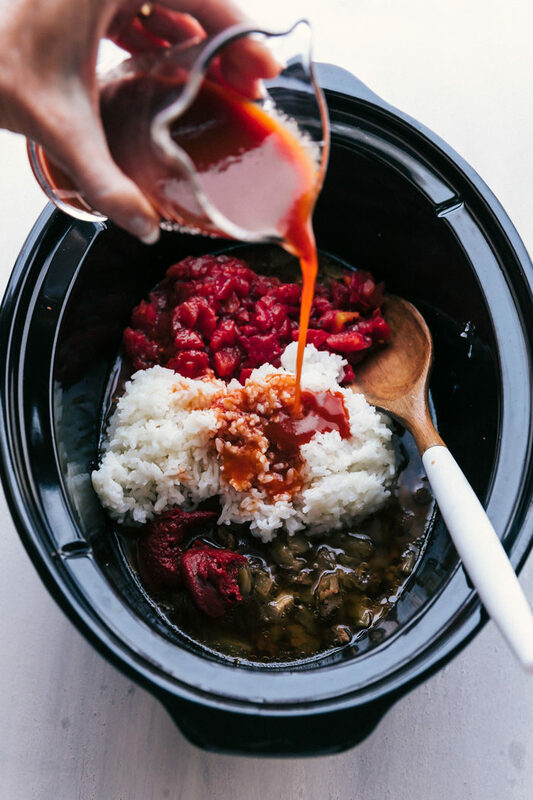 When the days are cold and the nights call for a savory bowl of hot soup, this Crockpot Cabbage Roll Soup will be hearty and delicious in every bite. If you love soup and your crockpot you will definitely want to make this cheesy ham and potato soup, creamy sausage and potato soup, or this easy hearty beef stew. 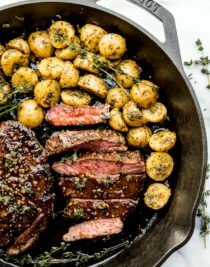 Perfect for friends and family and will warm you up on a cold night. Cabbage rolls soup is one of my favorite soups to eat, and using the crockpot makes it one of the easiest soup to make. 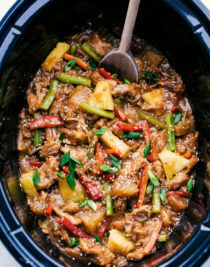 The magic of the crockpot always amazes me, there is nothing better than letting something else do all the cooking for you. 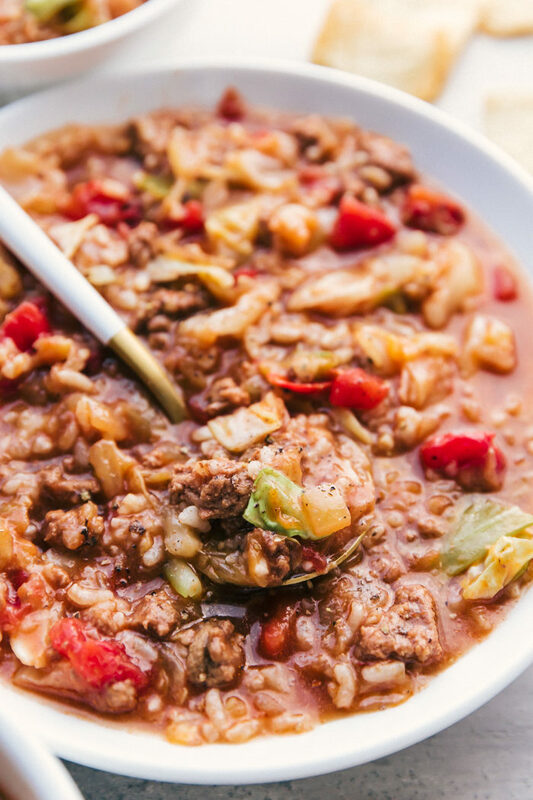 With this cabbage roll soup each bite is full of hearty vegetables, rice, ground sausage, and of course tons of cabbage, and it is all cooked in a delicious and slightly spicy tomato broth that makes all the flavors just pop. Cabbage is loaded with vitamin C and K and has less than 20 calories in every half a cup. Eating cabbage can also help protect against cancer, radiation, and reduce the risk of heart disease. 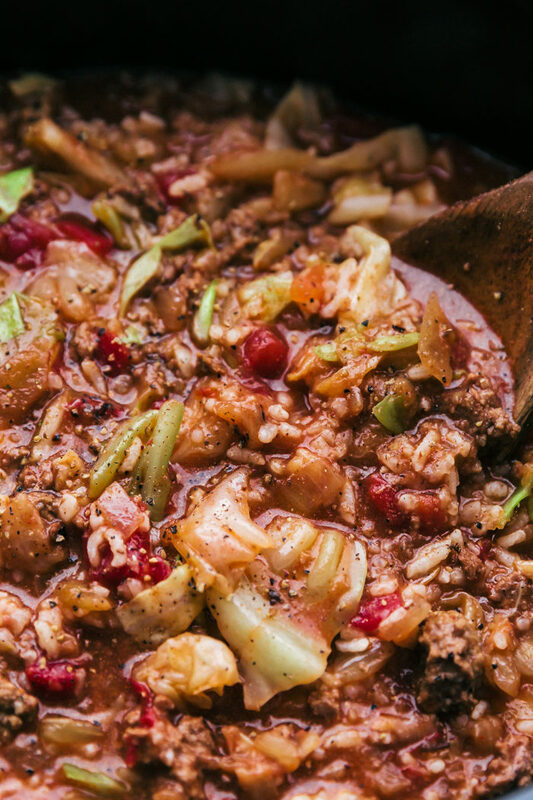 How do you make cabbage roll soup? 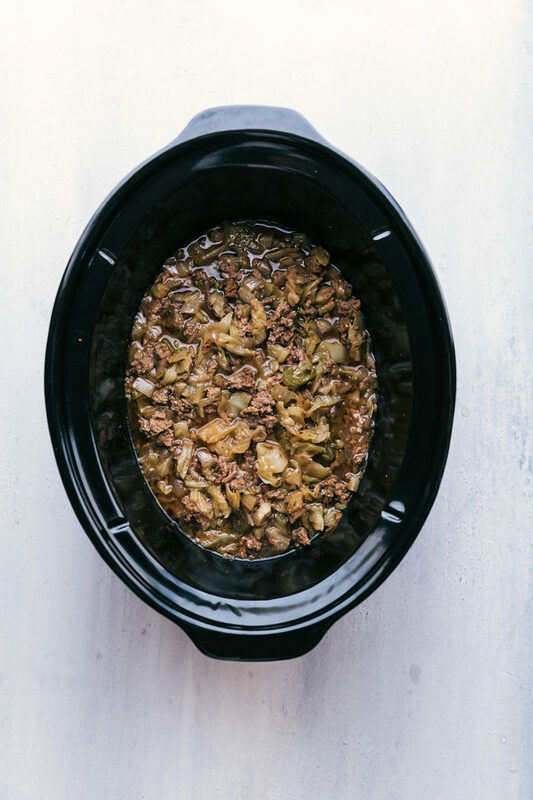 In a 6qt crockpot add chopped cabbage, beef broth, ground sausage, chopped onion, Worcestershire sauce, minced garlic, garlic salt, onion powder, cinnamon, and a pinch of sugar, mix to combine and cook on high for 4 hours or low for 7 hours. 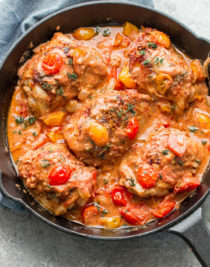 Add in cooked rice, diced tomatoes with juices, vegetable juice, tobacco sauce, and tomato paste, mix to combine and cooked covered for 30 more minutes and serve. 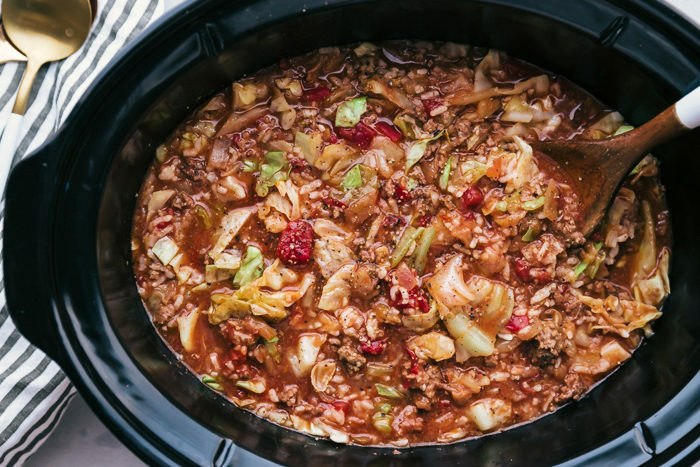 Crockpot cabbage roll soup is one of the easiest soups to make and it loaded with all the hearty ingredients you need to make a healthy soup for your family and friends. 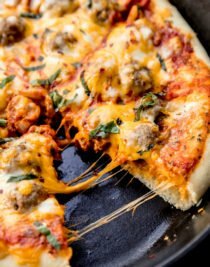 This cabbage and kielbasa skillet is another delicious recipe to make that is fast and full of cabbage that makes for a quick weeknight meal. 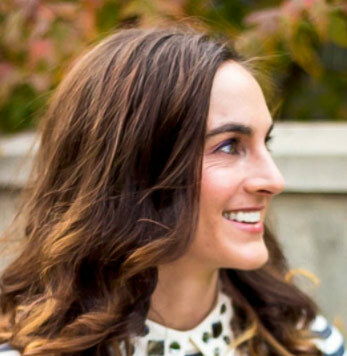 Can you freeze cabbage roll soup? Yes! 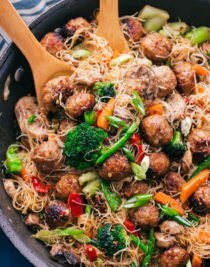 It is the perfect soup to freeze and reheat when your in the mood for something hearty and delicious. Allow the soup to cool and place in either an airtight container or in gallon sized zip lock bags. 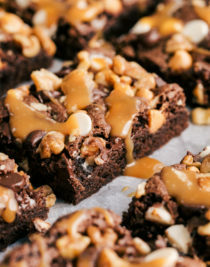 You can even put them in smaller bags to portion out in individual serving amounts. If you place your cabbage roll soup in the refrigerator it will last about 4 days, but if you want it to last longer you can freeze it. How many calories in 1 cup of cooked cabbage? 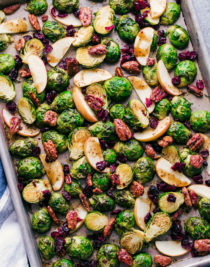 Cabbage has about 22 calories in each cup, cooked. It also is a very low carb vegetable with 2.3 grams of net carbohydrates per cup. 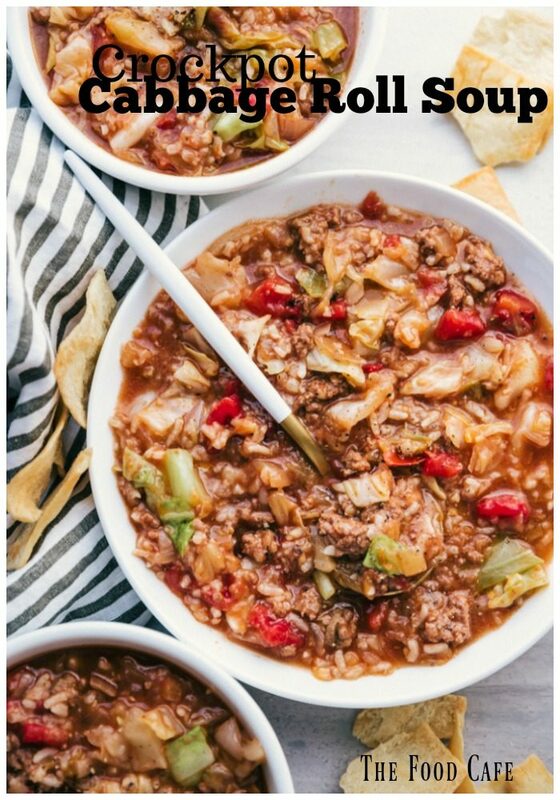 Cabbage roll soup can be made without the sausage and be replaced with vegetable broth to make it a vegetarian meal, that will taste amazing. 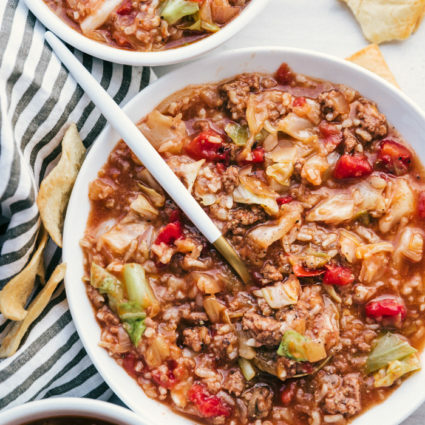 So don’t get caught without having something to warm you up at the end of your day, this crockpot cabbage roll soup will be the ideal recipe to take the chill off and fill you up in a healthy way. 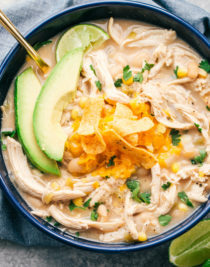 Do you need more soup recipe ideas? 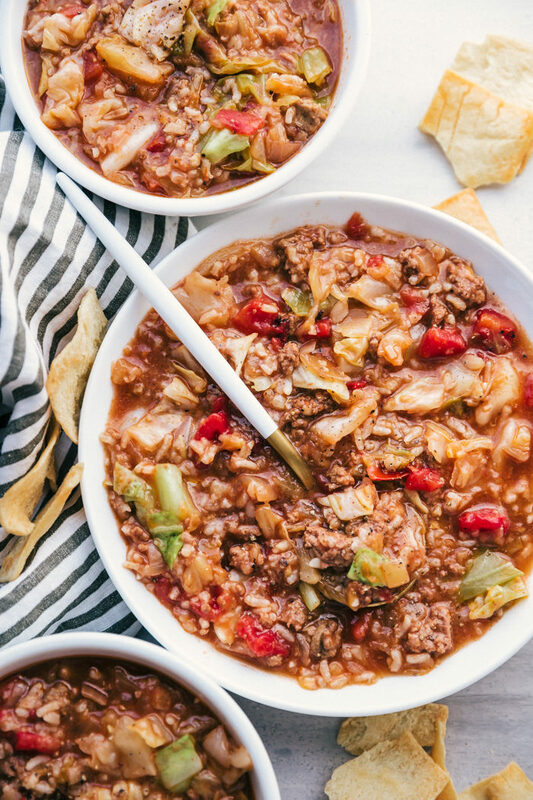 When the days are cold and the nights call for a savory bowl of hot soup, this Crockpot Cabbage Roll Soup will hearty and delicious in every bite.